RUSSIE – Yana RHS - The excavated site termed Yana RHS is dated to about 28000 BP and contained a stunning assemblage of ornamented and symbolic objects—the earliest art to be excavated in the Arctic zone. 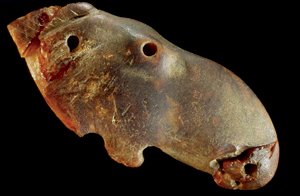 Decorated beads, pendants and needles connect the site to the Eurasian Upper Palaeolithic; but other forms and ornaments are unparalleled. Shallow dishes and anthropomorphic designs on mammoth tusks find echoes among hunting practice and shamanistic images of the indigenous Yukaghir people recorded in the early twentieth century. ALLEMAGNE – A Late Palaeolithic amber figurine has been skilfully recovered and reassembled from a ploughed open site in northern Germany. Dated between 11 800 and 11 680 cal BC it occupies a key point between the Magdalenian and the Mesolithic. The authors show that the figurine represents a female elk which was probably carried on the top of a wooden staff. They argue for continuity of art but change of belief in this crucial transition period. CHINE - China plans to build its first vessel capable of retrieving archaeological findings from the sea by the end of 2013, a major step to strengthening the underwater search abilities of Chinese archaeologists who currently rely on rented shipping boats. The 4.8-metre wide and 56-metre long boat, to be powered by an integrated full electric propulsion system, will "basically" meet China's underwater archaeological needs, according to a statement released by the State Administration of Cultural Heritage (SACH) on Wednesday. With a displacement of 860 tonnes, the vessel will be used in China's coastal areas and could sail as far as waters off the Xisha Islands, or the Paracel Islands, in the South China Sea, if sea conditions are good, it said. Archaeologists will be able to use the ship to detect, locate, map, videotape and excavate underwater archaeological findings, according to the SACH. ROYAUME UNI – Bury St Edmunds - Ancient artefacts which shed light on the development of a historic market have been discovered during an archaeological dig. Excavation work has been taking place at the site of Thingoe House in Northgate Street, Bury St Edmunds, which is set to become a care complex. Archaeologists from Oxford Archaeology East, which have been employed by the developers, have found evidence of a quarry dating to around the 12/13th century, which probably provided the materials used to build the town. 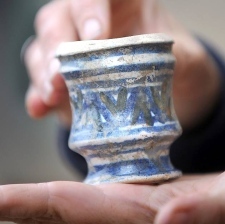 Other finds have included a Roman coin, a prehistoric flint, a 17th century tin-glazed apothecary jar and a well, which probably dates to the medieval period. Ms Clarke said so far there had been about 100 “small finds,” a lot of pottery and thousands of pieces of roof tiles.She said most of the finds were medieval and early post-medieval. The second phase of the excavation was due to start today. 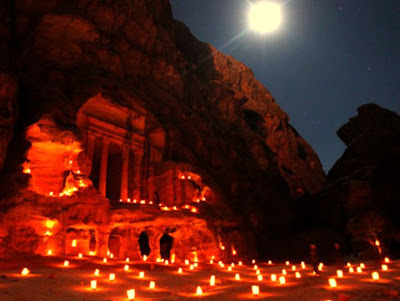 JORDANIE – Petra - Petra risks being listed by UNESCO as an endangered heritage attraction if authorities do not keep up with its preservation, it was reported on Thursday at an event to mark the 200th anniversary of the iconic site's rediscovery. 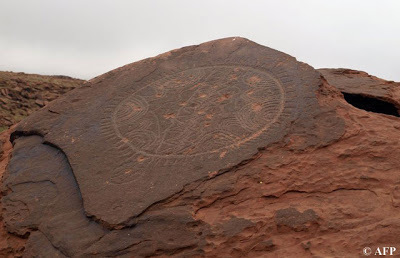 Petra Archaeological Park (PAP) commissioner, said the site could be added to the List of World Heritage in Danger if certain criteria set out by the United Nations Educational, Scientific and Cultural Organisation (UNESCO) were not carried out. Hijazeen said PAP had been concentrating on infrastructure improvements around the site over the last few years and had neglected conservation activities, the report said. Under UNESCO’s instructions, PAP is required to prepare an action plan by April 2013, draw up excavation research regulations by December 2012 and carry out a conservation report by February 2013. If these actions are not carried out, the site risks being added to the List of World Heritage in Danger, which currently lists 38 endangered sites, including Yemen’s historic town of Zabid, the US’s Everglades National Park, Palestine’s Church of the Nativity and Egypt’s Abu Mena Christian site in Alexandria.